Bovada.lv is one of the largest and most successful sportsbooks online. An important aspect of that success is that Bovada is one of the few such services that accepts players from the United States. Another crucial component of the brand’s popularity among gamblers is that Bovada does an amazing job with customer service and user-friendliness. Case in point is the newly redesigned Bovada mobile website that provides many features and that you can access from any device that supports a web browser. For sports bettors, Bovada offers a 50% match on your first deposit for up to a maximum bonus amount of $250. 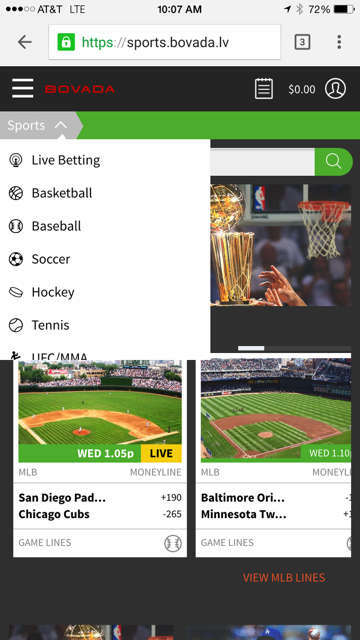 You can read all the details if you visit Bovada on your mobile device, then click the menu icon — often called a hamburger button, it looks like three horizontal lines stacked. This will bring up the menu, which slides out from the left. Click the Promotions button. Here you’ll find one titled $250 Sports Welcome Bonus. Click the box, and then click Learn More for details – but we’ll spell them out for you below. To claim this welcome bonus, you first need to create a valid Bovada account. Click here to visit Bovada, click the JOIN NOW button, and register your new account. Once you’ve created your account, log in and navigate to the Bonus Page. Simply find the $250 Sports Welcome Bonus in the list and click the Claim Now or Deposit Now button. This will bring you to the deposit page where you’ll make your first deposit. The minimum deposit amount for most deposit methods is $10. Bovada now accepts Bitcoin as a deposit method – with ZERO transaction fees! If you do not have a Bitcoin account, we recommend opening an account at Coinbase. You can read more about Bovada and Bitcoin here. Once your deposit clears, Bovada will match it by 50 percent up to $250. So if you deposited $10, you’ll get a $5 bonus, and if you deposited $500, you’ll get the maximum $250 bonus. This bonus money is good for placing free sports bets and wagers on horses. The bonus money can also be used in the Bovada Casino! However, note that placing a casino bet will increase your wagering requirement. If you stick to sports and horses, the wagering requirement is 5 times the deposit and the bonus, which means you’d need to wager $3,750 to clear the $250 bonus. If you use the bonus in the Bovada Casino, there is a 30x wagering requirement, which means the amount to clear would increase significantly to $22,500. Once you’ve satisfied these wagering requirements, you may withdraw your winnings (if any) from playing the bonus, however you may not withdraw any of the actual bonus funds. The bonus is only meant to be played with and cannot be withdrawn. A nice aspect of the new Bovada mobile website is that it looks like a desktop website rather than a mobile app or a streamlined mobile experience. Page features work seamlessly whether you’re using a mouse or using your finger on a touch screen. Once logged in, the homepage will show you the popular upcoming games. To find a specific sport or game, click the Sports drop down menu and select the sport of your choice. Selecting the sport will then list the upcoming matches for you to bet on. In the screenshot below, I’ve chosen the upcoming UFC bout. A nice touch of the mobile interface is that Bovada has added a bet slip icon at the top of the screen that provides you easy access to your bet slip if you ever lose track of it. Note that if your slip is stickied to the page you’re on, then the bet slip icon up top won’t be visible. 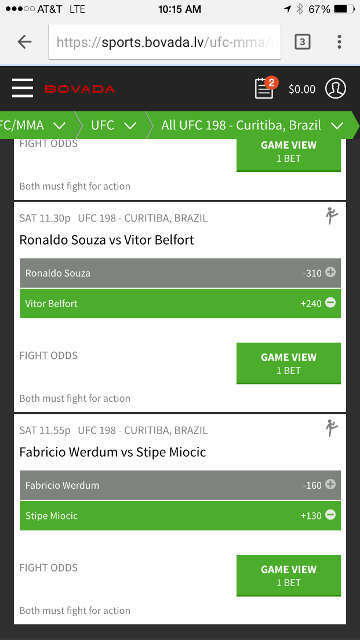 From the list, I’ve selected two fighters to win, which adds those selections to my bet slip located at the top of the screen. You will seen the number 2 there in red, to show that I have two selections waiting for me on my bet slip. The next step is to click on the bet slip icon, and enter the amounts I would like to wager. When I enter the amount to Risk, I can the amount I will Win. The final step is to click REVIEW BETS and then submit your bet slip if everything looks good! You can also choose to parlay your bets, which will combine all the bets on the current slip into one bet. The mobile bet slip is limited in that it doesn’t handle multiple distinct wagers when a parlay is involved. So if you want to parlay, you have to finalize that bet, and then add any additional wagers to a new ticket. 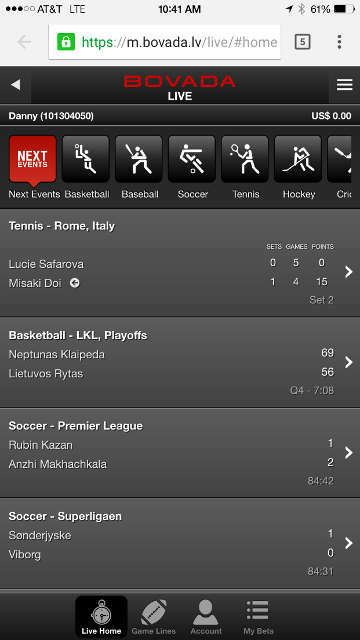 Clicking the Sports button will bring up the major sports: football, basketball, baseball, soccer and so forth. Scroll down the list to the All Sports button, which will add other options, such as motorsports, cricket and even e-sports. Click on a sport, then a match, and finally choose a bet option. That bet will be added to your slip. 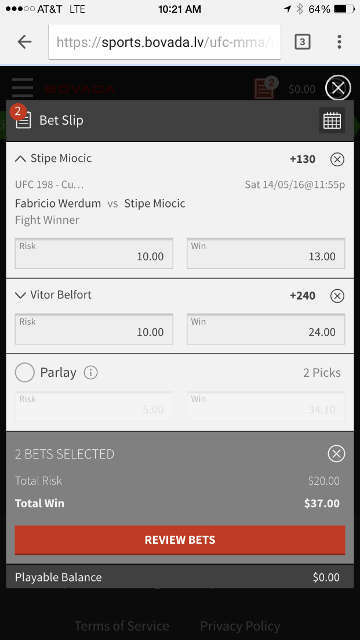 The slip covers all of your current bets, so you could combine a bet on an afternoon baseball game with a bet on a fight at the UFC event later that night. At the top of the list under Sports, you’ll notice an option labeled Live Betting. Clicking that will bring you to the live betting area of Bovada. Here, you’ll be able to place bets on events that are already underway. You can also cash in on bets early at a reduced payout, and if you enter the Live Betting area with bets already on the board, such as ones you made earlier in the day, then you’ll have the option to sell those as well if the circumstances are right. The neat thing about live betting is that it’s an interactive experience while a game you’re watching is underway. Bovada has always been impressive in terms of the sheer amount of in-play bets they offer, and the mobile website has it all as well. If a match has a prop bet and that prop bet still makes sense at that point in the game, you’ll be able to bet on it. Peruse the list for a game you’re interested in, and then click the arrow to the right side of the bar. This will bring up all of the bet options available to you. The bet slip is streamlined for in-play betting, and bets are processed quickly, which is important when your opportunity may be up in a moment or two. The only issue we have with Bovada live betting is that Bovada still doesn’t support live streaming. It would be nice to watch the games you bet on particularly when we didn’t have access to a TV. Click on the menu button next to the Bovada logo, and then click Promotions. You’ll notice a series of boxes that describe various promotions. The boxes you’re interested in right now are under the Sports header. All of these, unless explicitly stated otherwise in the description, apply to the mobile site. At the time of this review there were no bonus opportunities other than the Sports Welcome Bonus and the Refer-a-Friend bonus, but this is certainly a section of the site to keep an eye on. Ready to sign up? Click here to open your account! A single account at Bovada gives you access to all the Bovada mobile services! Read our review of the Bovada Mobile Casino here. Bovada has several options when it comes to welcome bonuses. Read this review of the Bovada bonuses here. Bovada Poker has migrated to Ignition Poker. Find instructions on redeeming this Ignition Poker bonus code for a $1,000 bonus!